Ten years ago today, my New Year's Eve was not much different than what I have planned tonight-hanging out with KROB (fifth wheel then, Scott wouldn't enter the picture for ten more months), with a low key night at her parent's house with pots, pans, and Martinelli's at midnight. Tonight however, there will be Champagne I can assure you. The last ten years have literally flown by in the blink of an eye, and I thought instead of a year-end recap, a trip down decade lane was in order with notable experiences and events from each one. This was a really tough year as a sophomore in high school. There was lamo teen drama on my dance team and it really brought Kerri and I down. Things took a turn for the super amazing in October when Scott asked me to homecoming and our love story began. He definitely was the best thing to come out of that year. The dance team also traveled to NYC that year, and I set shame aside for ten minutes and acted like a crazy woman to introduce a Blink 182 video, "Adam's Song," on TRL from Times Square. Let it be known that was when Carson Daly still hosted and the show was in its heyday. Best part-calling my classmates back home to turn it on and watch, and those who happened to see it talking about it when we came back. And no I don't feel badly for that poor girl next to me. She did not wear her favorite band's concert shirt and wave it around to get their attention. This was my favorite year of high school. 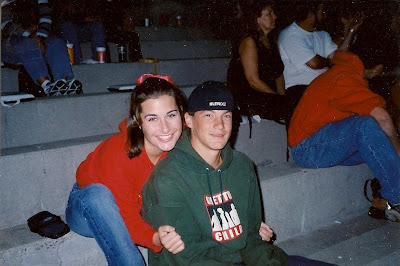 Between dating Scott and being an officer in ASB, as well as Kerri's co-captain on the dance team, it made for some awesome memories, including a cringe-inducing rendition of "Like a Prayer" at Spring Show. Which we reprised at my bachelorette party for some lucky patrons. Janae has to be one of the friendliest people on the planet. She is giving and has a heart of gold, and I am lucky to count her among my dear friends. 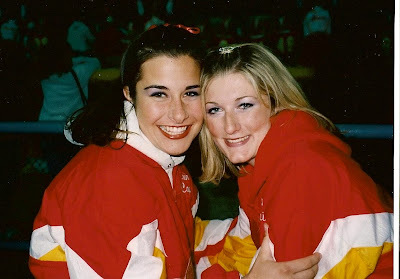 Late 2002 also brought me to college, the first of four I would eventually pay tuition to, and the only that gave me the thoughtful and amazing new friend, Ashley. We both joke now how each of us thought the other looked normal and nice enough to sit next to in our Freshman Foundations (or some awful name of that sort) class. We were even lucky enough to have several other courses together that semester (by luck) and the next (by planning). 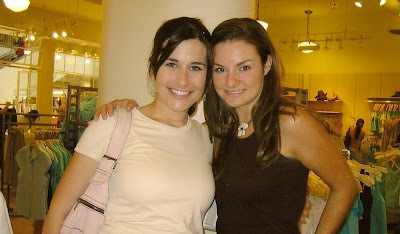 With her living on campus, I'd come on Tuesday nights after work and we'd watch Gilmore Girls together. She made college for me, even if only for one year together. I had my first major surgery in 2004, to remove a cyst in my thyroid. Weird, I know. I also spent my first holiday with Scott's family in Blythe for Thanksgiving, and we took our first and only college class together-swimming at Cypress College. 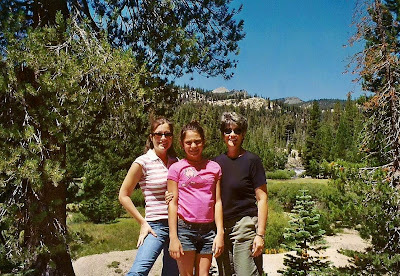 The fam bam traveled to Yosemite and hiked Half Dome (kidding, though we did see it), as well as spent time with our extended clan, the Harashas. An annual tradition for a number of years, KROB, Scott, and a handful of other friends made the trek up to Big Bear Mountain for several snowboarding trips. I truly miss these week-long adventures and wish that our lives weren't all so busy that we could find the time (and work time off) to carry on the tradition. My parents remodeled their house, and I remember several nights sleeping on the living room floor, on two mattresses, with the floor ripped up and watching LOST together. Most notably, my first friend got married, Mandy, to her high school sweetheart Joey, and I could not have been happier to stand up for her on that day. 2007 was the second year in a row that Scott went to Africa. The first year was hard because I did not know how I'd deal with his absence for six weeks. This time around, he went for nearly three months and I know he was having the time of his life, but I was practically a hermit crab despite Kerri's best efforts. Sadness aside, we were able to talk on the phone a few times thanks to a sat phone his friend Adam had, and I stayed up every night into the wee hours hoping to catch him online. The day he came home the second time, was almost as good as the day he proposed to me. 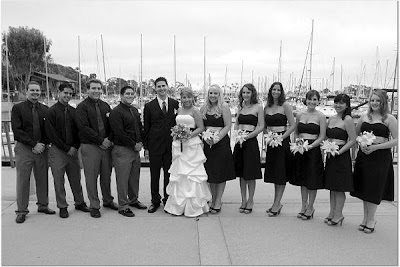 That same summer, my friend KM married her high school sweetheart, Andrew, in Dana Point Harbor in front of family and friends. Again, I was honored to stand next to these two as they tied the knot. 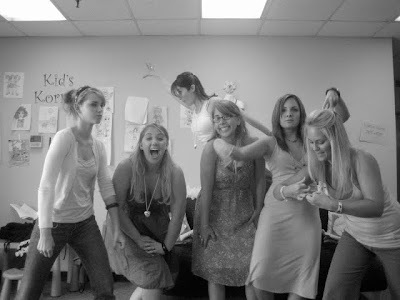 The year I really took a hold of this blog. If you go back far enough, I really had some random thoughts back while Scott was in Africa the first time, but truly found my voice this year. It's been a fun outlet for me and the writing that I enjoy without professional limitations. Like many have said before me, I enjoy the community that it brings together, both near and far. Additionally, my dear friend Ashley, the best thing that came out of Chapman University, got hitched! 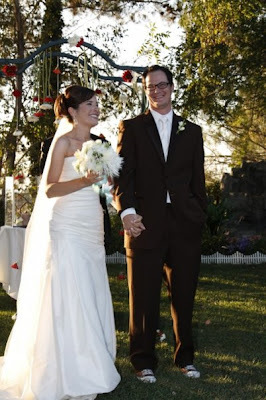 Her beautiful wedding still brings a tear to my eye when I think about it. I am eager to see what 2010 brings, especially 16 days in when my best girl gets married, and beyond. Cheers to you and yours and a prosperous new year! We were so little in that picture!!! What a great decade!